It wouldn’t be wrong to think of AC maintenance as being similar to the maintenance you get with your car—both are designed to substantially increase their lifespans while preventing any bigger problems from arising. EnergyStar has provided a checklist with some of the services you can expect and what goes into them. Keep in mind that they’ve provided just a sample of the kind of things that go into a maintenance check—every contractor does it differently! Cleaning the evaporator and condenser coils—two components vital to the function of your AC. Checking the AC’s refrigerant levels. A lack of refrigerant will put immense stress on your AC, as well as indicate the presence of a leak. Cleaning and adjusting the blower components. The blower is what blows air through your ducts—a necessary mechanism for cooling your home! Your air conditioner is rated for a certain efficiency. Once it comes out of the factory and starts working in your home, however, its efficiency will gradually decrease—that’s just a fact of life for a machine like an air conditioner. Maintenance helps reduce the decline in efficiency, keeping your monthly energy bills as low as possible. 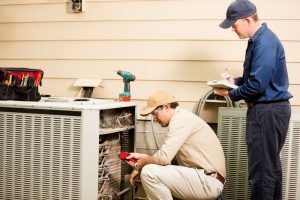 Another good reason for maintenance is the fact that it will help prevent some of the major issues that plague air conditioners. For example, something like a refrigerant leak—capable of becoming a disaster if left unchecked—is something that a maintenance check can easily uncover. If your air conditioner is ever going to break down, it’s most likely going to happen when it’s working at its hardest. For most people, that’s right in the middle of summer. How do we know? Because we’re always there to help them! Unfortunately, that means we can’t help all of them as quickly as we’d like. Maintenance will drastically decrease the odds of your AC breaking down, meaning you don’t have to sit in a hot home waiting for us to arrive. We provide our full list of maintenance services on our maintenance tune up page. Contact Air On Demand today to schedule your maintenance check!